There is nothing like grilled chicken in the summertime! These chicken legs were marinated first in a wet marinade, then grilled with occasional basting. Marinate for at least 20 minutes (check out my marinade choices on previous blogs like http://livligahome.blogspot.com/2012/06/great-marinade-for-chicken.html). Place the chicken legs on a hot grill, grilling 4 sides for at least 4 minutes, or until cooked. Serve 1 -2 chicken legs per person (kids will most likely want one). Clean and snap the ends off a bunch of asparagus. Bring water to a boil in a steamer. Stem the asparagus 5 - 6 minutes. Let it cool. Add 2 tablespoons of the light lemony vinaigrette. This can be made ahead of time, even the day before, refrigerated and then served when needed. Serve 5 - 6 spears per person. The rice pilaf was made with white rice because I wanted it to cook quickly. With forethought you could definitely use brown rice or even a grain like quinoa. After cooking it in chicken broth (1cup) and Water (1 cup), I added 1 tablespoon of chopped dates and 1/4 cup of chopped fresh parsley to complete the pilaf. Each person received a 1/2 cup serving. Can easily serve 6- 8 people. 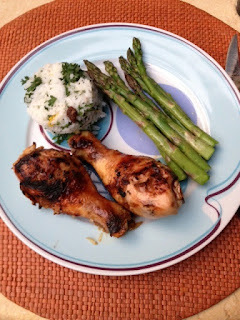 This meal is particularly kid-friendly because both the chicken and the asparagus can be picked up with your fingers. A fun and colorful summertime menu! Looks so delicious. Me and my spider vein removal company likes this so much. Keep sharing! Why Livliga works- its in the Design! In Search of a Non-Sweetened Soda-- FOUND IT! In Honor of Fresh Fruit and Vegetable Month!